Cressida is a character from the Trojan War, an event that also gave us the iconic Trojan Horse. Like that ancient trope, today's Nice Price or Crack Pipe Cressida contains a surprise. You'll have to decide if its price will make it worth letting through the gates. I was a little surprised at yesterday's 1970 Bronco camper's 79% Crack Pipe loss. After all, have you seen prices on early Broncos these days? Oh well, I guess that horse is already out of the barn. How about, this being Friday, we move on and do a CAR? Y'all like cars, right? Today we have an 1985 Toyota Cressida, the marque's luxury offering from back before there was the Avalon. Actually the first high-zoot Toyota offered here was the Crown, but by the time the eighties rolled around, the Cressida was the one pulling on the fancy pants. This 1985 edition has a lot of those luxury accouterments - chrome trim, leather seats, upright and reasonably elegant styling - but it also offers a little go with its show, owing to the quad cam V8 that has been shoved under its hood. I guess that 'shoved' is too crass a word for a Cressida. How about elegantly inserted? Whatever the method, man this install looks clean. The Lexus mill is paired with a 5-speed Toyota box and power is doled out to the back wheels by way of a limited slip differential. While the mechanicals have been shown a lot of attention, the suspension hasn't been totally neglected. The ad notes the addition of adjustable coil-overs and camber plates, and the whole thing has been dropped as is the fashion these days. A straight pipe exhaust means that the neighbors will be able to enjoy the car almost as much as you will. Bonus! Remember however, that this is first and foremost a luxe-ride, or at least that was Toyota's intention when they built it. This one has gone even further than the factory which means that in addition to the power everything and tufted leather seating there's a killer stereo, Nardi wheel and beer tap shifter to make you feel both upper and crust. The car has 102,000 miles on the chassis, however there is no mention of driveline time on the clock. The ad show pictures of the car with the standard U.S. wing mirrors and with black bat ear fender units like was once used in Japan, back in the '70s. There is also the note of a quarter-sized rust hole in the trunk floor being the only notable area of road rot. Aside from that, it looks pretty clean. The seller says that he used to do detail work for a limo company - which must have been a gross job - and hence knows how to keep his own ride looking top notch. He also says that this car is his summer drift project - which sounds like an eighties teen dramady - and hence is in no hurry to sell. If he does sell, it will be for a minimum of $8,000, and not a dollar less. 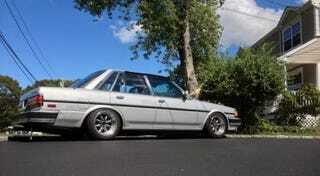 Let's help him plan his summer by determining if we think he'll sell this V8 Cressida with so strict a pricing standard. Reading the litany of updates in the ad, do you think this cool cat of a car is worth $8,000? Or, does that price mean you just don't get this seller's drift? Rochester NY Craigslist, or go here if the ad disappears. H/T to Terpsmandan for the hookup!